Quick question—are you like Jane or like Joey? Jane works a few times each month in PowerPoint and Joey works all the time. But for both Jane or Joey, it doesn't matter whether they work with PowerPoint too little or too much, as long as they get their tasks done quick! And nothing speaks “quick” better than keyboard shortcuts and sequences. Want a real-world example? Just the other day, someone asked me about a quicker way to bring up the Paste Special dialog in PowerPoint for Windows. And someone actually recommended that you hold the Alt and E keys at the same time, let them go and quickly press S, which is one of the keyboard sequences for PowerPoint. Well, there's a better way! You can press Ctrl+Alt+V together and save the trouble, and you would still see the Paste Special dialog box. 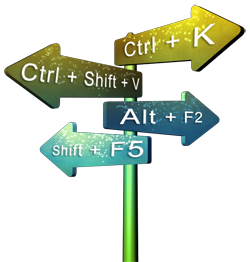 That was just one instance of how keyboard shortcuts can help you do tasks quickly and easily. But where do you find these shortcuts? 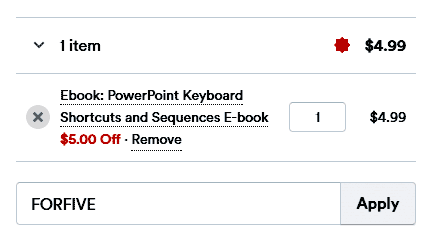 There are many PowerPoint keyboard shortcuts that are not documented even in the program's Help. Want to know about all these missing shortcuts and sequences? Or do you want to know if your favorite keyboard shortcuts are documented? 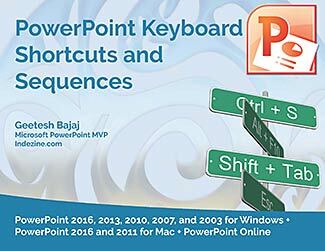 Get a copy of our PowerPoint Keyboard Shortcuts and Sequences e-book, and save time. This 146 page PDF e-book downloads quick, and typically costs you $9.99. But we will give you this e-book for just $4.99, only for the next 3 days. Use the coupon code, FORFIVE in the checkout box, as shown below. This ebook is updated based on feedback received from you. The current version of the e-book is 1.16 (released February 2017). This new edition has larger text, over 25 new keyboard shortcuts, and is designed to be landscape-oriented so that you can read it more intuitively on your desktop, laptop, or tablet screen.